Workers back in the Middle Ages wouldn't have believed it if someone told them that training documentation would someday be accessed by supervisors using apprenticeship forms downloads from a computer. Forms for both formal and informal apprenticeship can be found online by conducting a quick Internet search. 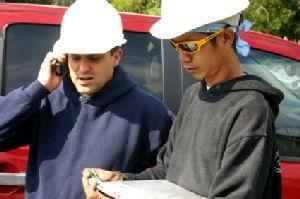 An apprentice is someone who learns a skilled trade by working with a highly skilled specialist. In some instances, being an apprentice can be a level in a ranking system that signifies the worker is working at the entry level stage of learning the trade. Common apprenticeship occupations include plumbers, electricians, and other occupations which require a good amount of on-the-job training. Trainees may have one particular supervisor who is responsible for teaching them everything they need to know, but in many cases he or she can work with several skilled tradespersons at once. The U.S. Department of Labor, Employment and Training Administration features a thorough library of information for apprentices and their supervisors on the Registered Apprenticeship website. Formal programs within the United States are presided over according to the National Apprenticeship Act, which is designed to protect workers and ensure they are learning a valuable trade while not getting taken advantage of. Using apprenticeship forms downloads, supervisors can track progress and make sure the trainee is learning everything needed to one day be successful at the trade. Division of Apprenticeship Standards: The state of California offers downloadable forms, which can serve as examples in addition to a resource library available regarding apprenticeship programs. The New York State Department of Labor: New York's DOL also has a selection of downloadable forms that can provide good examples of documents needed for apprenticeship programs. Most businesses and unions with apprenticeship programs have their own forms available for download on their respective websites. Other businesses and unions keep this information inaccessible to the public. For example, some companies and organizations feature their apprenticeship forms on intranet pages, where only authorized personnel have access. If you are looking for an apprenticeship form for a specific company or organization and cannot locate the documentation on the group's official website, try contacting the human resources department for direction. In some cases, the form might be sent to you through the mail, while in other cases you may receive an electronic file via e-mail. Some organizations will not release forms to people in an informal manner, but instead reserve their apprenticeship forms for bona fide candidates. Although many supervisors may keep a casual log of an apprentice's progress, it is important that they file all documents to the specifications of the governing organization. This means that although downloaded forms may be great references, if the company the supervisor works for supplies specific forms, then this is the documentation that should always be used to record progress.